Once you're assigned to a conversation, you can review customer details, respond to messages, and share attachments from the Message dashboard. Review through the customer's current conversation in the main window on the left. 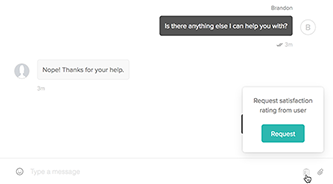 You can use the Timeline panel on the right to review past conversations with a customer. The first conversation listed in your Timeline represents your current conversation and will display the last message sent. 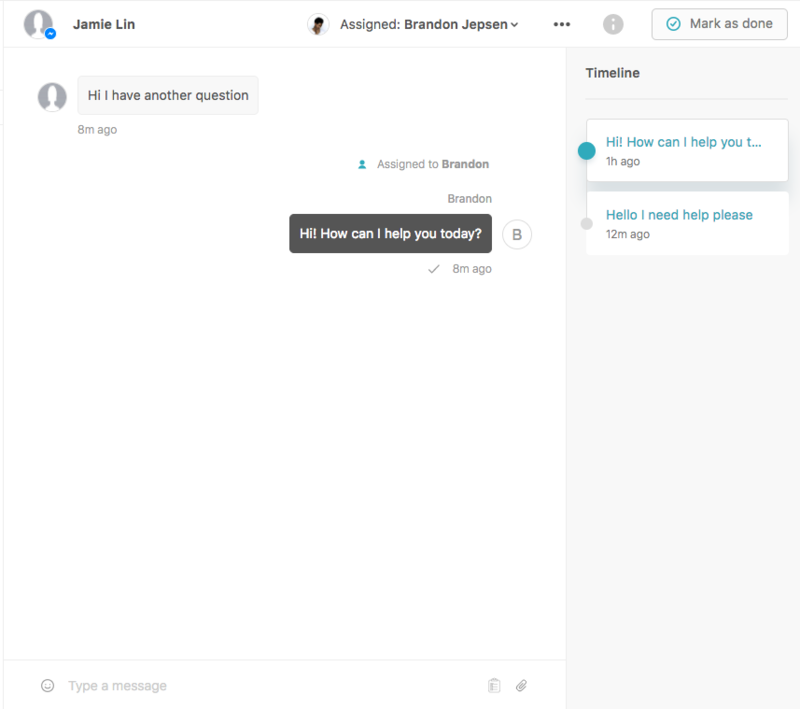 By default, conversations will be represented by the first message sent and the time the conversation was marked as done (see Marking conversations as done). 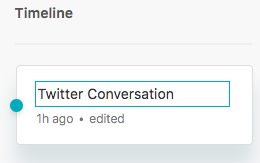 You can change the title of a conversation, by clicking the conversation title in the Timeline, then entering a new one. If you enter a new title, "edited" will appear next to the time. If you want to download a conversation, you can click the Export icon ( ) next to the assignee's name at the top of the conversation, then select Export transcript. The conversation will be downloaded as a text file. You can type text or share attachments in a conversation. Attachment options are configured in the Chat dashboard. For details, see Managing file sending. Keep in mind that different channels you're using might also have their own file type and size restrictions. Type your message into the composer field. Note that if you're not already assigned to the conversation, sending a message automatically assigns it to you. If the message can't be delivered, a red exclamation point icon appears next to it. Click the paperclip icon in the composer field or drag and drop a file into the composer field. Click the smiley face icon and select an emoji. 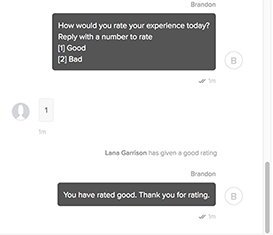 You can request satisfaction ratings from customers at any point during the conversation. Satisfaction ratings are automatically enabled. You cannot customize any satisfaction rating text or icons. Click the clipboard icon in the message field, then click Request. Note: You cannot customize the satisfaction rating request text. The customer can respond with either a 1 (good) or 2 (bad) to indicate their satisfaction rating. The rating is final; customers cannot change or remove it, unless the agent requests another. Marking a conversation as Done moves it from your list of active conversations to the list of Done conversations. Click Mark as done in the upper-right.